After teaching Middle and High School (emphasis on Juniors and Seniors) for the past 22 years I could not agree more. Kids seek relevance more than anything. They want to know WHY the curriculum (usually “chosen” for them) is something they need to know and HOW, specifically, it will help them in their future paths. “Because I said so” is not a viable answer, but as much as we more progressive educators want to relinquish control to students – to have their passion-driven inquiry be the guiding light for our intellectual pursuits and have them, as my friend and mentor Alan November is known to say “own the learning”, schools and teachers are still beholden to certain standards and expectations set forth by the institution itself or perhaps even a larger entity – the State or society. 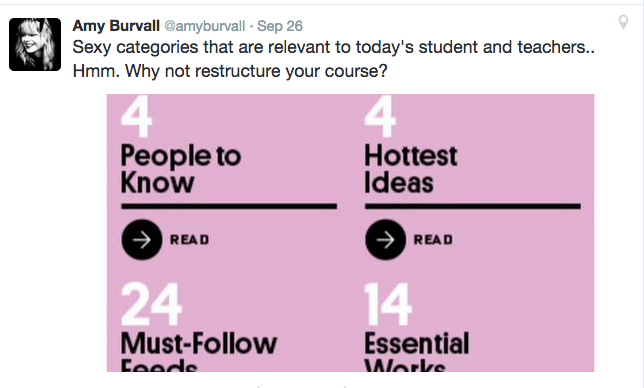 I proposed on Twitter that teachers rethink their curriculum into such categories. They probably already have at least the historical foundation for “essential works”, “people to know”, and the “big ideas”. I would really make an effort for curating a list of great websites, blogs, and social media feeds (like Twitter accounts, for example), of relevant people and organizations. Perhaps even making YouTube playlists featuring TED and Big Think talks, and the like would be a great start. Better yet, ask STUDENTS to curate and contextualize their “finds”. Students can contribute via personal blogs and presentations, a collaborative web space (like a class G+ community or Wiki), a social bookmarking service like Diigo, individual YouTube accounts with playlists, or even in analogue fashion with Post-It notes on a wall in the room (for example, each wall could represent one of the four categories). Why not have students pose an interesting question related to the subject on Twitter and Facebook and “follow the conversation” as it unfolds in the global classroom that is social media? Thoughts? I’d like to hear more of your ideas. I am increasingly finding inspiration from outside the realm of education. I am also drawn to articles and conversations about cultural literacy. My anchor text for these is probably “Cultural Literacy: What Every American Needs to Know” by E.D. Hirsch. Hirsch made the case and outlined in great detail a curriculum for a traditional, largely Eurocentric approach to curriculum and school learning. I think we need more opportunities to have conversations about this topic. Our world continues to become more filled with information, and our collective attention landscapes are increasingly fractured with so many possible information and data streams. More than a laundry list of topics, I think cultural literacy today needs to be a set of skills to access, filter, archive, and share information. Many adults outside schools (sadly) seem to still tend to view educational standards and outcomes as a laundry list of dates, events, facts and people. I think it’s hugely important that we find tangible ways to help ourselves, our peers, and others in our communities make this “shift” into a world of information overabundance. Cultural literacy in this era should mean so much more than a list of “Who’s Who” and what are the scientific issues of the day. Cultural literacy should mean the ability to effectively access, manage, use and share information to solve problems, deepen understanding and accomplish tasks. 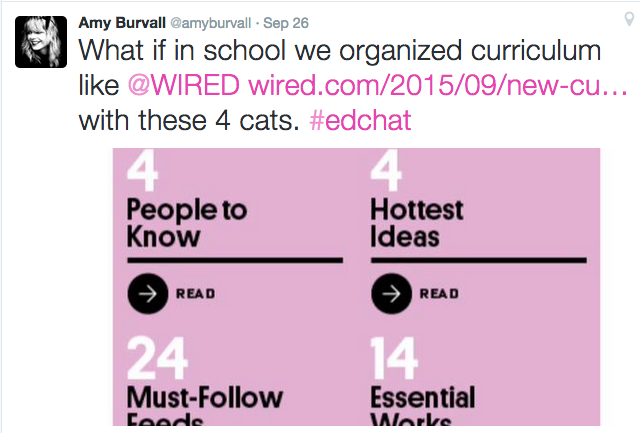 This entry was posted on September 30, 2015 by amyburvall in Uncategorized and tagged alan november, amy burvall, cultural literacy, curriculum, education, learning, social media, twitter, wired magazine.